2. To have fun! That's what music is all about! This course will teach beginners basic sitting position/technique, skills such as arpeggios/scales/chords, and basic sheet music knowledge. As you progress we will be talking about different eras of classical music from the renaissance to modern styles. My goal as your teacher is to have you playing from day 1! Lets learn to make music together! Hello there! 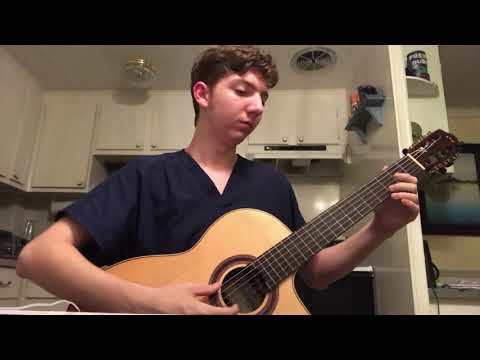 I am currently a sophomore in college studying nursing, but also pursuing classical guitar during my spare time. Please do not be discouraged by me being only 20 years old; I may be young, but I am experienced. I went to a well known performing arts high school in Florida where I helped start their classical guitar program. I was the first guitar major to graduate from the school, and the first to specialize in flamenco guitar. My job after starting the program was to assist my teacher with her new students, which was a class of over 40 high school students (all of them trying different genres of music). I still teach a couple of those students, and some of them have gone on to receive recognition and awards in music. You do not need to be a virtuoso to play these styles of music! My goal is to have you playing from day 1! We will also focus on material you want to learn, while combining material any guitarist needs to learn. First lessons involve basic chords which will guarantee your early success on the guitar! Other topics include how to hold the guitar, strumming, finger picking basics, and how to produce specific sounds. If you are experienced with guitar, allow me to help with any musicality or performance issues you may have. As a teacher I like to make phrasing of music one of my main focuses. I want you to really tell a story with all of the music you are making, even if it is just an exercise! I hope to make your musical journey an enjoyable one that will last you a lifetime! I'm looking forward to working with you! Please let me know if you have any questions at all, whether its more about me, what other things go into my lessons, or if you want to know more about what the guitar can offer you! "Music should reflect the poetry and emotions of life"
I was relaxed during my first lesson with Zach because Zach is a great communicator, intelligent and knowing. I feel I've learned some new techniques which I feel good about practicing and look forward to my next session. Zach is the perfect match for me. He's intelligent, patient and imparts not too much information so I was relaxed and learned much and already see progress from my first lesson. I made a great choice. Great experience! Flexible, understanding, and always willing to help even outside lesson time. Zach is amazing he's very knowledgeable and most importantly takes his time. He moves along as you progress. If you need him he's only a phone call away. Took one lesson with him and learned so much! Highly recommend for the beginner. Zachary was an such an amazing teacher to my daughter Ashley. She has been wanting to learn how to play guitar for some time now, and I could not be happier with having picked Zachary as her first teacher! He was so informative and was very patient with her! She preformed her first solo in front of our family on Christmas and it was amazing. Such a nice young boy, and would defiantly recommend to anyone looking! Zack is a great musician! His teaching methods are great. Its very interactive, hands-on, and fun. He has been at this for years so he knows how to get the info through to you. I have been his student for about 6 months now and i have learned so much. I performed for my family and it was an amazing experience! I would definetly recommend. Zach is an amazing guy. His young age inspired my son (8 years old), and he relates more to his younger students being closer in age to them. He explains everything in great detail that's easy to understand, and has a genuine love of music. He will have you playing from your very first lesson!